The Italian language is spoken by more than 70 million people residing all over the world. In this hemisphere there are more than 10 million descendants of immigrants from Italy living in countries from Canada to Argentina, with the United States second only to Italy itself in number of Italian-speaking residents. 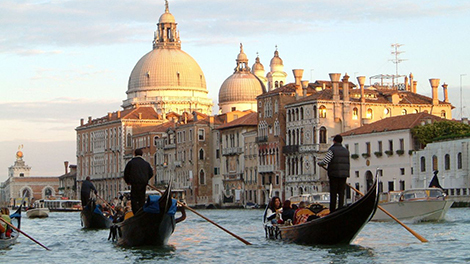 In addition to studying the grammatical aspects of Italian, students learn about the culture, history and literature of Italy, a country that, for over 2,000 years, has been at the center of the artistic and cultural history of the western world. The Italian program is relatively small and extremely friendly, which means that students develop relationships with their professors and instructors, to whom they turn for guidance and mentoring. Students also develop friendships with their classmates, as they take courses and participate in extracurricular activities hosted by the Italian Club or the department, and study in Italy together. The courses in the major and minor are theme-based, which means that grammar, vocabulary and the four language skills (reading, writing, listening, reading) are refined while students learn about the history, art, languages and cultures of Italy. Have a question about Italian or want more information? Let us know. Most students who major in Italian pair this with another major in a variety of areas, such as communication, international studies, English and the sciences. After graduation, students go on to study medicine, law, anthropology, education, find jobs in business, non-profits, the travel industry or join programs such as the Peace Corps or Teach for America. Class time is devoted to developing all four language skills — speaking, listening, reading and writing — as well as a strong background in Italian culture. These skills are developed through the use of movies, videos, songs, magazines, the internet, texts and online language practice. As students progress in the major and develop their language skills, they may choose from a variety of intermediate- and advanced-level linguistics, culture, literature and history courses. Students are encouraged to study abroad. Italian is applicable in a variety of settings in the United States and abroad. Mastery of Italian allows students to consider careers in such fields as education, government, international trade (in fashions, machinery, wine and foodstuffs, for example), banking, print or electronic media, scientific and medical research, or tourism. Many employers are eager to hire graduates who are fluent in Italian because their businesses involve Italian speakers. Careers in which Italian is the primary emphasis include teaching Italian at all levels, interpreting and translating for government and for private and public organizations, and a variety of positions in the travel and tourism industry at home or abroad. Examines Italian and American mafia movies made from 1905 to the present day and traces the history of the Italian and Italian American Mafias. Taught in English. Development of language skills while studying the structures and uses of modern Italian and the languages spoken in Italy today. Closed to native speakers of this language. Examination of the experiences and perspectives of Italians (including emigrants) through reading, film, and discussion. Topics could include popular culture, Italian Americans, and immigrations in Italy. Closed to native speakers of this language. Covers the same material in Italian 1101, 1102, 1103 and is designed for students with knowledge of a Romance language or Latin. Closed to native speakers of this language. This program is specifically designed for students at the elementary level who would like to attend a program with a group of students from OSU to obtain 9 hours of credit. Students have the option to stay with Italian host families. For intermediate-level students who would like a full-immersion experience in Italy, and Italian minors and majors. Students stay with host families and participate in a service-learning program. 4, 6, 8 week or semester-long options. Italian Club is an organization of Ohio State students and faculty interested in the Italian culture and traditions. Many activities are organized throughout the year, including conversation tables on campus, movies and dinners. The semester-long Internship program combines workplace learning with classroom-based studying. Students are placed in different fields, including international embassies, cultural institutes, charitable associations and fashion companies, and attend intensive language classes in Florence and Rome.